Banner Finishing Products: Starter Kit For Easy Custom Banner Finishing – DISCOUNTED SPECIAL!! Free shipping if you order today. Banner Ups Banner Hanging Starter Kit For Easy Custom Banner Finishing. DISCOUNTED SPECIAL $89.95! More than 20% off! Are you ready to start making banners faster, stronger, and easier? 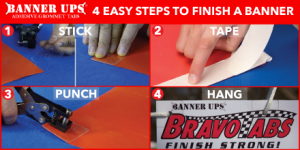 The Banner Ups Starter Kit will help you do just that and is perfect for easy custom banner finishing. Kit contains: 100 Banner Ups Clear BravoTabs (our most versatile tab), 1 roll of Banner Ups Clear PowerTape (1.5″ x 36 yd roll), and 1 ea Banner Ups PowerPunch (heavy duty hole punch sized right to tabs). Enough for about 20 banners, The Starter Kit will let you give Banner Ups a good trial and find out why so many banner makers LOVE Banner Ups when it comes to custom banner finishing products! Crystal Clear Banner Ups BravoTabs. Square shape works great on banner edges or corners. Durable for outdoor use. Use with PowerTape for banners over 6 ft. 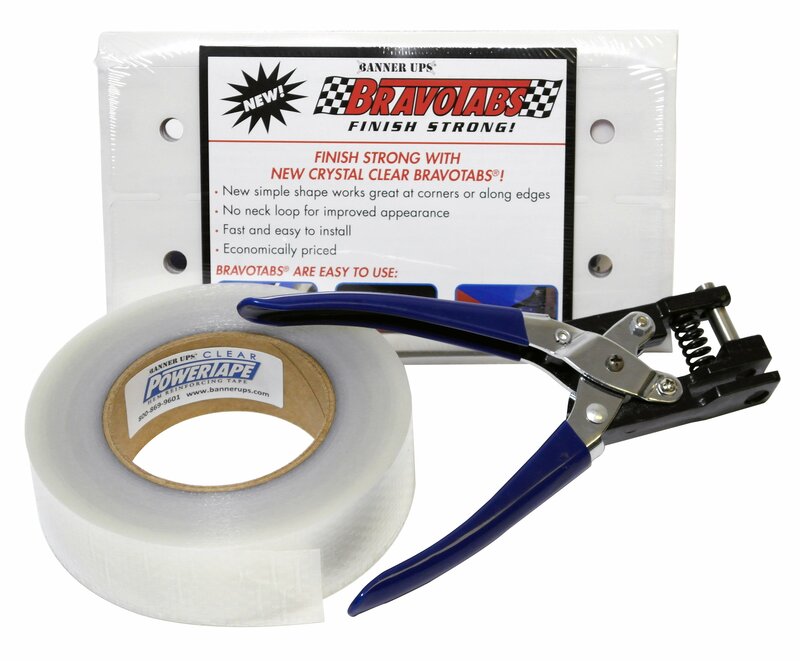 Banner Ups Clear PowerTape super-strong single sided hem tape. No folding of hem required! Now in clear! Perfect for double-sided banners. PowerPunch – Perfectly sized heavy duty hole punch. Tough enough to cleanly punch tab, tape, and media. Great for punching 4mm corrugated plastic or foam board too!